Superpowers #0: Project Superpowers is Back! 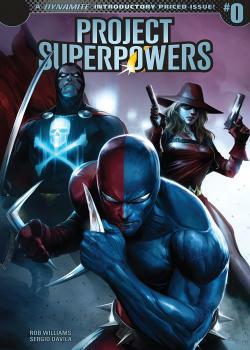 Written by Rob (Suicide Squad) Williams, illustrated by Sergio (Swords of Sorrow, Superman) Davila, and featuring an all-star roster of cover artists, this introductory priced issue is the perfect starting point for the most ambitious superhero story of 2018. An all-new threat faces the Earth, while the team faces turmoil from within and must overcome all obstacles to prove their worth and value in a world that desperately needs its heroes. The Death Defying Devil, Samson, Black Terror, Masquerade, Green Lama, Scarab and more are all here as the adventure begins again.. Featuring an introductory story leading right into the all-new #1 next month, Project Superpowers #0 is action-packed and introductory priced. Includes bonus materials and 16 pages of original story.